This is a very small photo 4 1/4" H x 2 1/4"W, about the right size for a Carte de Viste - but not mounted on cardboard. It is on heavyweight paper or VERY light cardboard and was bound into a folding carboard pocket, bound on the left with ribbon or string - you can see the little holes on the left edge of the photo, where it was once held into the little cover. The cover is a light colored cardboard and the covering flap is smaller and has a scallop-like loose edge. This photo (the oval) is 4"H x 3"W and is mounted on a larger sturdy cardboard measuring 7 1/2"H x 4 3/4"W with square edges. The cardboard mount has a double border of a bold gray border outside and an a thinner gray line inside of that. This image DOES change in the light and gives a "negative image" reflected in the light when tilted and viewed at an angle. The clothes, hat, props and background have to have some clues to date it. The background appears to have been a painted landscape with trees reflected into water behind the girl and small tufts of tall grass on her right. She's wearing what appear to be leather gloves. The coat has a huge collar and cuffs to match with BIG buttons down one side. 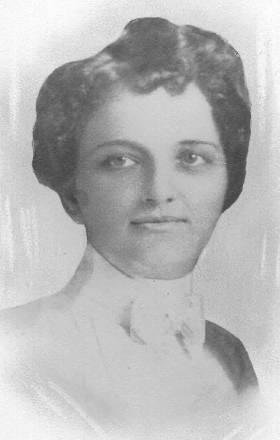 It looks like she has silk bows in her hair underneath a unique hat which has a peculiar but deliberate fold off-center from the front. 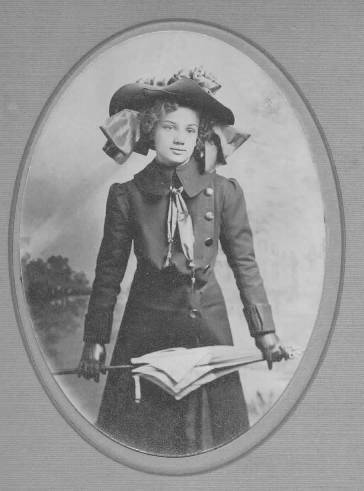 She has a knotted silk tie with what appears to be tassles at the end. I sure would love some help with this one! Is it 1910ish or early 1880's? 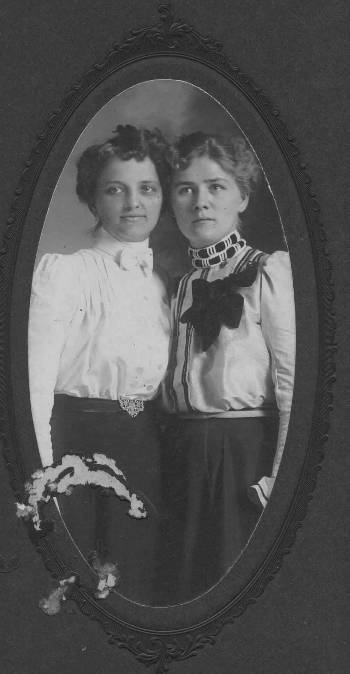 This is Lena on the Left, and the woman on the right looks a lot like her sister-in-law, Edna (Henry's sister). Lena did not have a sister...just one brother. The whole Evans family used to visit and spend vacations at their grandfather's house built here to retire in (Bellaire, Mich). The home stayed in the family until about 1940, and we have many photos of various Evan's families in the summer here together. This photo (the oval) is 6"H x 3"W and is mounted on a heavy cardboard which is rectangular and measures 8 1/2"H x 4 1/2"W. The oval border is very elaborate and embossed into the card which imprint goes all the way through to the back. The Photographer was also embossed (originally in gold, as specks of gold still remain in the indent). 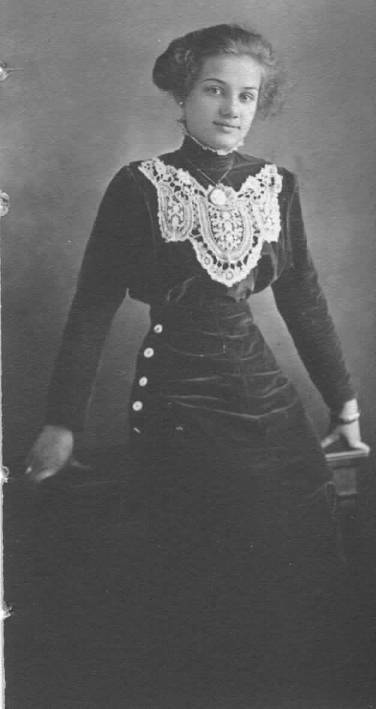 It reads: W. G. Warner, Bellaire, Mich.
Lena's image was later reproduced as a single portrait. The reproduction is not very good but is mounted in a cardboard display folder with another Photographer's mark...Cregar (probably in Springfield OH). There appears to be red nailpolish spilled on the original photo and the same red stuff is also visible on the back of the reproduction .